David S. Ware vs. dialysis, Ware wins. We all win. We win free jazz minus the racket. Just pure music. For a while there, David S. Ware had everyone scared. The saxophone wizard had been on dialysis for years before being told by doctors he was going to need a kidney transplant in order to survive. Our modern-day Coltrane took it all in stride and was back on stage in less than a year, circular breathing and all. Free jazz proponents were excited and relieved to see him perform a solo set that would eventually turn into the album Saturnian (solo saxophones, volume 1). It didn't matter that he walked out with a cane, and it didn't matter that he was sitting down -- the giant was back. Shortly after that set in 2009, he went back to tend to some unfinished business. Before the surgery, Ware wanted to commemorate his fifty years in music by releasing a unique album, one that would be completely improvised. In just one day Ware, along with contemporary jazz cohorts William Parker on bass and Warren Smith on percussion, nailed down Onecept, despite the complete lack of charts and rehearsals. Its appeal is abstract too; these nine songs are the rare glimpse of three jazz musicians lifting the sound way above their heads and pushing it through the ceiling. It's almost a stretch to call it jazz. It's just...music. If the idea of a sax-bass-drums album of completely spontaneous music scares you, there are some factors on your side. First of all, Ware alternates his horns from tenor sax to stritch to saxello. Parker makes pragmatic use of his bow and Smith isn't always content to sit behind a conventional kit. Tympani drums and auxiliary cymbals are sometimes the only rhythmic root at work here. So when you think about it, the album is impressive in two ways: First, that so much sound comes out of three guys, and second, that Ware still has unexplored ideas popping out of his brain after playing sax for half a century. Opener "Book of Krittika" is what you do when you are granted complete freedom and you run with it. It's only Ware in the beginning, sending a fury of notes into the microphone, yet keeping himself under perfect control before the others arrive. Halfway through the song, everyone decides to just shift gears and make it almost a new song. Ware and Parker drop out while Smith partners his kettle drums up with silence, a very underrated tool in the opinion of yours truly. A gong-like cymbal will occasionally add color, but is used sparingly. Ware and Parker's reentrance into the jam is hardly assuming, like they had just stepped out to the bathroom. "Astral Earth" works the same magic over the course of 15 minutes. Instead of storming out of the gate, Smith sets the stage with gentle taps on the tympanis. Ware doesn't create a driving melody so much as he just lets one float in the wind, seeing what can carry it along and where. It's refreshing, and a little bit profound, to find three musicians who are not afraid of the silence. When it comes to free jazz, people expect a lot of skronking to come from the horn section. David S. Ware's saxophone work is free and rapid, but not forceful. You could say that his tone, sounding more like a plea than anything confrontational, is reflective of his harrowing experiences in declining health. Ware seems to be asking for something in his playing, something that isn't easily coming to him. This could be the summation of his driving force after all these years. He's waiting for a response to his call. For its virtues, though, Onecept is still a challenging listen that could potentially drain any free jazz newcomer. 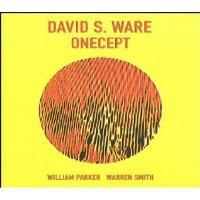 Those unfamiliar with David S. Ware would be better served to start at a place like Surrendered or Go See the World or perhaps Threads, his excursion in string ensembles. Even Ware admits in the liner notes that distinguishing these compositions from one another is too abstract a task. He insists that what's important is the unifying effect. The one concept. Now just put those two words together. Truly, not bad for having a new kidney.